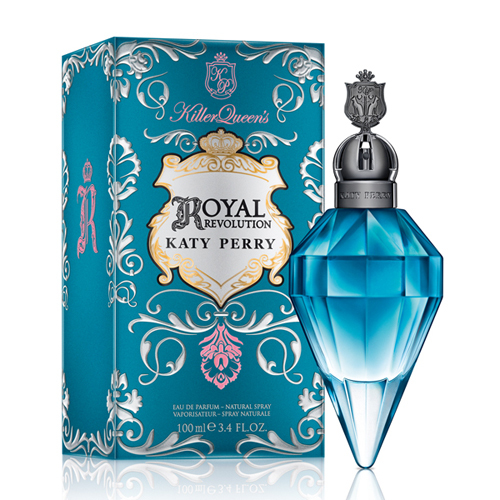 Katy Perry Killer Queen Royal Revolution is lighter and more energetic. Katy Perry Killer Queen Royal Revolution 100ml. Eau De Parfum is the epitome of feminine power and violates all the rules - says Marsha Brooks, vice president of marketing for Coty Beauty Fragrances, letting the flavors of the singer. - It reflects the essence of Katie. American star Katy Perry is known not only for its hits, but bright outfits and outrageous behavior at the concerts. Since 2010, the singer released perfume that reflects the nature of the Katy - on the one hand, explosive and rebellious tomboy, and on the other - feminine and gentle lady. Eau de Toilette, created by pop singer, has always attracted the attention of the secular community, thanks to an aggressive advertising and uniquely decorated bottles. For example, in 2013 the perfume market has a flavor Killer queen: the bottle in which it was delivered, was carried out in the form of refined scepter. Perfume Katy Perry killer queen Royal Revolution, released a year after this release, distinguished blue bottle-scepter, as was the 2013 edition flankers. If you want to buy perfume Katy Perry Killer Queen Royal Revolution, be prepared to "start a riot and lead the revolution with a playful smile on his lips." The aroma was positioned as the smell of victory, inspired by the history of the famous blue diamond. Perfume of 100 ml of a composition basically chords "thorns - flower-defender, known in the Middle Ages magical properties." In addition, the fragrance pyramid opens notes of pink freesia and red garnet, leading to Sandalwood floral (orange blossom and jasmine petals) heart. The mysterious base consists of soft leather and notes of musk with hints of vanilla orchid.